Artemisia plant belongs to the Asteraceae (Compositae) family and is helpful in traditional treatment for cure of different sicknesses.,, Artemisia is included in the tribe of Anthemideae which is comprised >500 species. Among them, thirty-four have been reported in Iran, some of which are endemic. Among them, Artemisia turanica Krasch. grows naturally in wide regions of Iran. In our previous research, it has been shown that the extract of A. turanica has antimalarial activities against rodent malaria in vivo in mouse model. The aims of this study were to study the chemical composition and antimicrobial, anticancer, toxicity, mutagenic, and antimutagenic activities of A. turanica oil growing wild in Iran. The main equipment types used were a Clevenger-type apparatus, Shimadzu UV-2501PC spectrophotometer, made in Japan, and DNM-9602G ELISA reader (Perlong Group, Beijing) made in China. The mutagens such as sodium azide, 2-nitrofluorene, and 2-aminoanthracene were from Merck Company from Germany. Laboratory reagents and microbial and cell culture media were from Merck, Germany. The aerial parts of A. turanica were collected in October 2011 from Baam village, after Gahreman Abad in Esfarayen, North Khorasan Province in Iran. Plant specimen was identified by Dr. Vali Aallah Mozaffarian (Research Institute of Forests and Rangelands, Tehran, Iran). The voucher specimen no. 12572 has been deposited at the herbarium, Department of Pharmacognosy, Faculty of Pharmacy, Mashhad University of Medical Sciences, Mashhad, Iran. The leaves of A. turanica plant were dried at 25°C in a dark room for a week. Air-dried leaves of A. turanica (80 g) were separately subjected to hydrodistillation using a Clevenger system for 3 h. After separating and drying the oil with anhydrous Na2 SO4, the essential oil was recovered. The volatile oil yield was 0.80% (w/w). Gas chromatography analysis was done on a Shimadzu 15A gas chromatograph equipped with a split/splitless injector (250°C) and a flame ionization detector (250°C). N2 was employed as a carrier gas at a flow rate of 1 mL/min. The capillary column was DB-5 (specifications: 50 m × 0.2 mm, film thickness, 0.32 μm). The column temperature was kept at 60°C for 3 min, then heated to 220°C at a 5°C/min rate, and afterward kept constant at 220°C for 5 min. Relative percentages were calculated from peak areas by a Shimadzu C-R4A Chromatopac Data Processor without the use of correction factors. Gas chromatography–mass spectrometry analysis was done by a Hewlett Packard 5973 instrument with an HP-5MS column (specifications: 30 m × 0.25 mm and film thickness: 0.25 μm). The column temperature was kept at 60°C for 3 min, programmed to 220°C at a rate of 5°C/min, and kept constant at 220°C for 5 min. The flow rate of helium as carrier gas was 1 mL/min. The mass spectra were taken at an electron impact energy of 70 eV. The retention indices for all components were defined according to the van den Dool method, using normal alkanes as standards. The constituents were identified by comparison of their relative retention indices (DB5) with those reported in the literature and through comparison of their mass spectra with the Wiley library. Bacterial strains were distributed on Mueller-Hinton agar plates using sterile cotton swabs. A volume of 5 μl of dimethyl sulfoxide (DMSO), loaded on sterile blank discs, was placed on the agar plates and was incubated at 37°C for 24 h. There was no antibacterial effect on the plates, and DMSO was selected as a safe diluting agent for the volatile oil. Five microliters of each sample dilution, using a 0.45-μm membrane filter, was added to sterile blank discs. The solvent was used as control. Escherichia More Details coli (ATCC 25922), Staphylococcus aureus (ATCC 25923), Acinetobacter baumannii (ATCC 17978), Pseudomonas aeruginosa (ATCC 8830), and Candida albicans (ATCC 5027) strains and nutrient agar culture were used in this investigation. Bacterial suspensions were made in brain–heart infusion (BHI) broth to a concentration of about 108 colony-forming unit (cfu)/ml. Agar disc diffusion method was operated for determination of antibacterial effects of the oil in question. A volume of 0.1 ml from 108 cfu/ml bacterial suspension was spread on the Mueller-Hinton agar plates. Filter paper discs with 6-mm diameter were medicated with 5 μl of the undiluted oil and were placed on the inoculated plates. These plates, after remaining at 4°C for 2 h, were incubated at 37°C for 24 h. The diameters of the inhibition zones were measured in millimeters. Tests were repeated three times. Tests were conducted in BHI broth supplemented with Tween 80 (final concentration of 0.5% [v/v]). Test strains were suspended in BHI broth to give a final density of 107 cfu/ml and these were confirmed by viable counts. Minimal inhibitory concentration (MIC) and minimal bactericidal concentration (MBC) were measured. 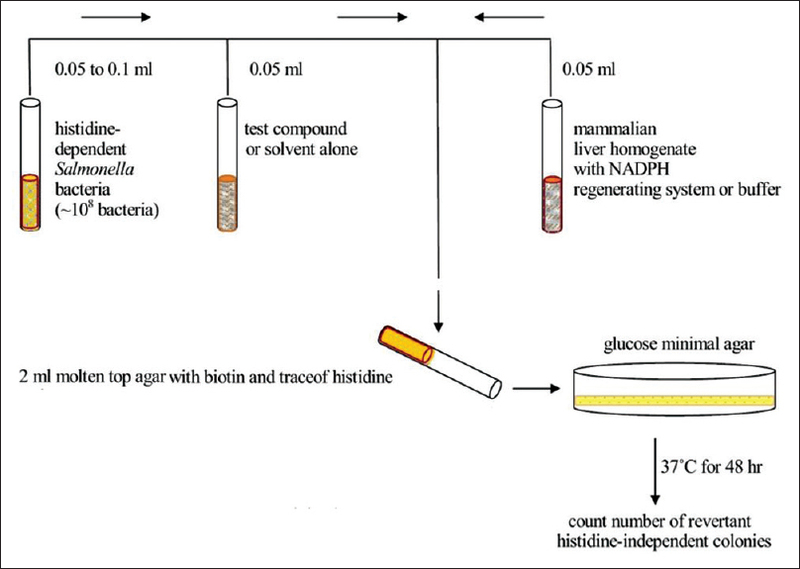 MIC was evaluated by a broth dilution manner in test tubes as follows: 40 μl from each of different dilutions of the volatile oils was added to 5 ml of BHI broth in tubes containing 107 cfu/ml of live bacterial cells. The tubes were incubated on an incubator shaker to evenly disperse the oil throughout the broth in tubes. The highest dilution showing no visible growth was regarded as the MIC. About 0.1 ml of cell suspensions from the tubes showing no growth was subcultured on BHI agar plates in triplicate to determine if the inhibition was reversible or permanent. MBC was determined as the lowest concentration at which no growth occurred on the plates. Forty microliters of essential oil at the dilution measured by MBC was added to each 5 ml of BHI broth in tubes containing of 107 cfu/ml bacterial suspension and was incubated at 37°C in an incubator shaker. About 0.1 ml of samples was taken after 5, 10, 15, 20, 25, 30, 45, 90, 120, 150, 180, 210, and 240 min. The samples were washed with sterile pH 7.0 phosphate buffer, centrifuged at 10000 rpm/min, then resuspended in the buffer, and were spread cultured on BHI agar for 24 h at 37°C. Phosphate buffer was used as diluent when needed. Microbial colonies were counted thrice after the incubation term, and the mean total number of viable cells per milliliter was calculated. The mean total number of viable bacteria from bactericidal kinetic experiments at each time interval was converted to log10 viable cells through usual mathematical formulae. The HeLa (human cervical carcinoma) cell line NCBI code no. 115 (ATCC number CCL-2) were prepared from Pasteur Institute, Tehran, Iran. In addition, the cells were grown in RPMI 1640 supplemented with 10% fetal calf serum, 100-μg/ml streptomycin, 100-U/ml penicillin, and 1% w/v glutamine. The human healthy lymphocyte cell line NCBI code no. 124 (ECACC number 91112124) was prepared from Pasteur Institute. The cells were grown in RPMI 1640 supplemented with 10% fetal bovine serum (FBS). Cells were cultured in a humidified atmosphere at 37°C in 5% CO2. Cytotoxicity experiment detected the reduction of 3-(4,5-dimethylthiazolyl)-2,5-diphenyltetrazolium bromide (MTT) by mitochondrial dehydrogenase, to the blue formazan product, which reflected the normal functioning of mitochondrial and cell viability. The cells (5 × 104) were seeded in each well containing 100 μl of the RPMI medium supplemented with 10% FBS in a 96-well plate. After 1 day of adhesion, a serial of doubling dilution of the oil was added to triplicate wells over the range of 1.0–0.005 μl/ml. The final concentration of ethanol in the culture medium was retained at 0.5% v/v to avoid toxicity of the solvent. After 2 days, 10 μl of MTT (5-mg/ml stock solution) was added, and the plates were incubated for an additional 4 h. The medium was discarded, and the formazan blue formed in the cells was dissolved with 100-μl DMSO. The optical density was measured at 490 nm using a microplate ELISA reader. The cell viability curves were calculated from cells incubated in the presence of 0.5% ethanol. Cytotoxicity was expressed as the concentration of drug inhibiting cell growth by 50% (IC50). All tests and analyses were run in three times and mean values were recorded (HeLa cells; y = 1.2827× + 27.327; R2 = 0.9815) (lymphocyte cells; y = 0.006× + 27.976; R2 = 0.9787). The S9 metabolic activator was prepared just before use by adding: deionized water 130 μl, phosphate buffer (0.2 M) 500 μl, MgCl2 (0.1 M) 80 μl, KCl (0.33 M) 100 μl, glucose-6-phosphate (0.1 M) 50 μl and NADP (0.1 M) 40 μl, and 100 μl of S9 fraction. The mixture was kept on ice during the experiment. S9 fraction, the liver postmitochondrial supernatant of rats treated with the mixture phenobarbital/β-naphthoflavone to induce the hepatic microsomal enzymes, was purchased from Moltox. 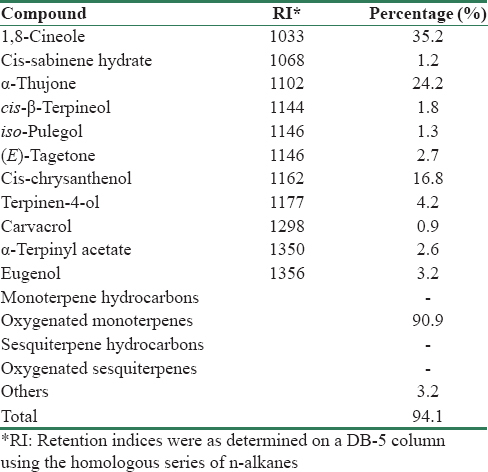 Bacterial toxicity was evaluated based on the quantities in [Table 1]. For the toxicity test, 12 ml of nutrient agar and 0.50 ml of S9 mix or pH 7.4 phosphate buffer 0.2M, 0.1 ml overnight culture of the Salmonella More Details strain, and 0.01 ml of the essential oil dilution were then added to tubes. The contents of the tubes were then mixed and poured into the surface of glucose minimal agar plates. The glucose minimal agar consists of 1.5% agar, 0.2% citric acid, 0.02% MgSO4.7H2O, 0.35% NaNH4 HPO4.4H2O, 2% glucose, and 1% K2 HPO4. The plates were inverted and placed in a 37°C incubator for 2 days. Then, the colonies were counted. Results were presented as the number of revertant colonies per each plate. Comparisons of bacterial counts on test oil plates with bacterial counts on control plates were used to determine the growth inhibition. Mutagenic activity was evaluated by the Salmonella/microsome test, using the Salmonella typhimurium tester strains TA98 and TA100, with (+S9) and without (−S9) metabolization, using the preincubation procedure. It is significant that the same number of bacteria should be used in the preliminary toxicity test as well as in the definitive mutagenicity experiment. Salmonella inoculated cultures 15–18 h before performing the test. Top agar melts supplemented with 0.05-mM histidine and biotin and maintains at 43°C to 48°C. To the 13 mm × 100 mm sterile glass tubes maintained at 43°C, add in the following order with mixing after each addition. Each test should be performed using a single batch of reagents, media, and agar. The top agar, consisting of 0.6% agar and 0.6% NaCl, is one of the most critical medium components in the Ames test because it contains the trace amount of histidine (0.05 mM) for limited growth. It also contains biotin at a concentration of 0.05 mM which is in excess of what is needed for the growth of the Salmonella strains. Using preincubation, we studied the effect of metabolic activation. In condition without metabolic activation, 0.01 ml of each concentration of test ingredient, negative control, or positive control was added to 0.5 ml of 0.1-M phosphate buffer (pH 7.4) and 0.1 ml of each strain (approximately 1.6 × 106 cells/ml) and then incubated at 37°C for 20 min. After shaking incubation, 2 ml of top agar was added to the incubation mixture according to the strains and then poured onto a plate containing minimal agar. The plates were incubated at 37°C for 48 h [Figure 1], and the revertant colonies were counted manually. In the presence of S9, 0.5 ml of freshly prepared S9 mix instead of 0.1-M phosphate buffer (pH 7.4) was added to the incubation mixture. Other procedures were performed in the same way. All experiments were performed in triplicate [Table 2], [Table 3], [Table 4], [Table 5]. The colonies are then counted, and the results are expressed as the number of revertant colonies per plate. The standard mutagens used as positive controls in experiments without the S9 mix were 2-nitrofluorene for TA98 and sodium azide for TA100. In experiments with S9 activation, 2-aminoanthracene was used with TA98 and TA100. DMSO was served as negative (solvent) control. Results obtained in mutagenicity tests are shown in [Table 2] and [Table 3]. The percentage of mutations was calculated through the (T/M) ×100 formula where T: The number of revertant colonies in the presence of essential oil and M: The number of revertant colonies in the presence of mutagen. The number of colonies that had been grown up was deducted from the numerator and denominator. Results obtained in antimutagenicity experiments were shown in [Table 4] and [Table 5]. All tests were run in triplicate and mean values were obtained. All the experimental data are presented as mean ± standard error of mean of three individual samples. IC50 value was calculated from the dose-response curves. Antibacterial activity was evaluated in terms of zone of inhibition to an accuracy of 0.1 mm, and the effect was calculated as a mean of triplicate tests. As it is shown in [Table 6], 11 components, representing 94.1% of the total composition, were identified in the leaf oil of A. turanica. 1,8-Cineole (35.2%), α-thujone (24.2%), and cis-chrysanthenol (16.8%) were the major constituents in the leaf oil of A. turanica collected from Esfarayen in Iran. Table 6: Composition of the leaf oil of Artemisia turanica Krasch. Antifungal and antibacterial activities of A. turanica oil were evaluated by three methods: (1) disc diffusion method, (2) determination of MIC and MBC, and (3) bactericidal kinetics of the essential oil, through various dilutions (2.5 mg/ml, 5 mg/ml, and 10 mg/ml). 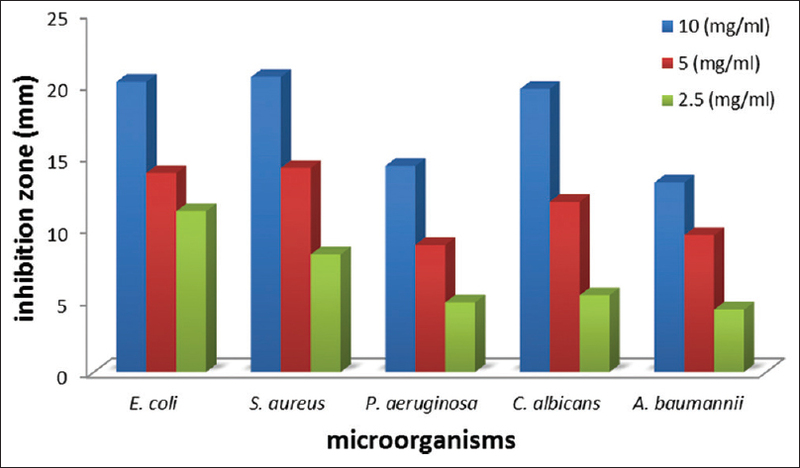 The results of antibacterial effects of the volatile oil of A. turanica are listed in [Table 7]. Maximum inhibition was obtained against S. aureus (20.50 mm), followed by E. coli (20.17 mm), C. albicans (19.67 mm), P. aeruginosa (14.33 mm), and A. baumannii (13.17 mm) at a concentration of 10 mg/ml of the oil [Figure 2]. Complete death time on exposure to A. turanica oil was 6.43 min for E. coli (D value = 6.43 min). Table 7: Antimicrobial activity of the essential oil of Artemisia turanica Krasch. Cytotoxicity was evaluated through MTT test [Figure 3]. The cytotoxic activities of A. turanica oil were tested through lymphocyte and HeLa cells [Table 8]. At a concentration of 28 μg/ml, oil inactivated HeLa cells by 62.53%, and at lower doses, the oil was tolerated by the cells and its 50% cytotoxic concentration was 17.67 μg/ml. The oil displayed an excellent cytotoxic activity toward the tumor cells. In other words, at a concentration of 5600 μg/ml, essential oil inactivated lymphocyte cells by 60.62%. Hence, the oil exerted a highly significant cytotoxic activity on the HeLa cancer cell line. The IC50 showed that cytotoxicity of the oil toward human cancer cells is much higher than that required for human healthy cells. The Ames assay is generally used to detect mutagenic and antimutagenic activities and is a widely accepted way for identifying various drugs and chemicals that can cause gene mutations. In the current investigation, the concentration of the essential oil (0.8 mg/plate) was selected based on a primary toxicity assay. The colonies were counted to evaluate the mutagenic and antimutagenic abilities of A. turanica oil. Mutagenesis and antimutagenesis percentages of A. turanica oil against S. typhimurium strains TA98 and TA100, with (+S9) and without (−S9) metabolization were computed and presented in [Table 9]. The maximum percentage of antimutagenicity of A. turanica oil was seen in 0.8 mg/plate on the 2-nitrofluorene by the bacterial reverse mutation test in the strain of S. typhimurium TA98, without the presence of S9. Oxygenated monoterpenes, especially 1,8-cineole (35.2%), α-thujone (24.2%), and cis-chrysanthenol (16.8%), were the major constituents in the leaf oil of A. turanica collected from Esfarayen in Iran, in October 2011. The other main components in this oil were terpinen-4-ol (4.2%) and α-terpinyl acetate (2.6%). In contrast, the aerial parts of A. turanica Krasch., which were collected from the Marzdaran region (northeastern Iran), in November 2002, revealed the main identified compounds in the volatile oil of A. turanica to be 1,8-cineole (40.9%), cis-verbenyl acetate (19.0%), and camphor (11.0%). Oxygenated monoterpenes such as 1,8-cineole (34.2%) and α-thujone (25.5%) were the major components in the leaf essential oil of A. turanica collected from Iran. 1,8-Cineole (37.7%), α-thujone (26.7%), and cis-chrysanthenol (15.3%) were the major components in the leaf oil of A. turanica collected from Baam village, after Gahreman Abad in Esfarayen, Province of Khorasan, North East of Iran. Nineteen components of the oil of A. turanica were characterized, representing 90.6% of the total components detected. The major constituents were identified as 1.8-cineole (23.3%), chrysanthenone (21.3%), and davanone (19.3%). In the current study, measurement of MBC and MIC from the oil of A. turanica indicated that all the test organisms were approximately sensitive to this oil, but E. coli was the most vulnerable one. Bactericidal kinetics of the essential oil of A. turanica indicated that E. coli is the most vulnerable. In the previous investigation, the essential oil from the leaves of A. turanica from Iran was investigated for antibacterial activity. Bactericidal kinetics of this volatile oil indicated that E. coli is the most vulnerable (MIC = 2.5 mg/ml, D value = 6.43 min). In previous study, the methanol extract A. turanica collected from Iran did not show any antibacterial activity against E. coli. These results of cytotoxicity experiment showed low adverse side effects of the use of A. turanica oil. The tested oil seemed to deserve further research. Although all in vitro tests hold limitations with regard to possible in vivo efficacy, the results of this investigation are very promising with regard to possible antineoplastic chemotherapy and form a basis for future studies. Essential oil components have a very various mode of action in bacterial cells and eukaryotic. For bacterial cells, they are having strong bactericidal attributes, while in eukaryotes, they modify apoptosis and differentiation, interfere with the posttranslational modification of cellular proteins, and induce or inhibit some hepatic detoxifying enzymes. Since, volatile oils may induce very various effects in eukaryotes and prokaryotes. In previous research, the cytotoxic effect of A. turanica oil was investigated. For cytotoxic activity experiments, a potato disc tumor inhibition manner was exploited. The oil of A. turanica exhibited tumor growth inhibition (100%) at concentrations equal to 0.02% (w/v) and higher. Based on previous study, the leaf essential oil of A. turanica from Iran was investigated for cytotoxic effect. IC values for HeLa and lymphocyte cells were calculated to be 17.67 and 3291.49 μg/ml, respectively. The results suggest application of A. turanica oil as a natural anticancer agent. According to a previous study, the anticancer potential of CH2 Cl2 extract of A. turanica on human leukemic cancer cell lines was proven. According to Emami et al., the ethanol extract of A. turanica against two human tumor cells (Hep2 and HepG2) was determined by MTT test. Based on these results, toxic effects were higher on HepG2 compared with Hep2 cells. Metabolic activation of some active ingredients of A. turanica extracts was converted to more toxic metabolites and caused more toxicity in the mentioned cells. The volatile oil of A. turanica showed good antimutagenic effects in the presence of 2-nitrofluorene, in the strain of S. typhimurium TA98, without the presence of S9 (metabolic activation). On the other hand, the mutagenic activity of A. turanica oil in the strain of S. typhimurium TA98, at the presence of S9, was more than its antimutagenic activity against 2-aminoanthracene. The essential oil of A. turanica has shown moderate mutagenic activity in the strain of S. typhimurium TA100, in both conditions of presence or absence of S9. However, in the presence of chemical mutagens, the volatile oil of A. turanica showed resistance against this mutagens and has antimutagenic effects in the strain of S. typhimurium TA100 in both conditions of presence or absence of metabolic activation (S9). The large-scale use of essential oils requires accumulation of toxicological data on these substances. There is a relationship between carcinogenesis and mutagenesis. The Ames mutagenicity experiment is a short-term bacterial reverse mutation assay specifically designed to detect a large range of chemicals, which produces gene mutations and genetic damage. These mutations are the consequence of DNA damage induced by various mechanisms. To our knowledge, there was no investigation on the mutagenic and antimutagenic effect of volatile oil of A. turanica before. In the current research, the antimutagenic effect of A. turanica oil was observed at 0.8 mg/plate in the bacterial reverse mutation assay in both strains of S. typhimurium TA100 and TA98. The mutagenic and antimutagenic activities of the essential oil of A. turanica have not been reported up to now, but based on the previous study, the leaf oil of A. turanica acts as a natural antioxidant agent. Total phenol content of the leaf oil of A. turanica was determined to be 237.87 ± 6.66 μg GAE/mg oil. A. turanica oil exhibited a dose-dependent scavenging of 2,2-diphenyl-1-picrylhydrazyl, nitric oxide and superoxide anion radicals with IC values of 7.00 mg/ml, 9.69 μg and 14.63 μg, respectively. Ferrous ion chelating activity of the oil (IC50 = 16.97 μg) was lower than ethylenediaminetetraacetic acid. Studies have shown the presence of flavonoids as a source of antioxidant and free radical scavengers in many Artemisia species. The results from the effect of A. turanica oil on lymphocyte cells and S. typhimurium show that the essential oil of A. turanica may be exploited as a natural antimutagenic agent and antimicrobial and anticancer source with low adverse side effects. The results of this research are very promising with regard to plausible antineoplastic chemotherapy and form a basis for further studies. The authors acknowledge the Research Deputy Office of Islamic Azad University's Takestan Branch for the financial support (Grant no. TIAU: 50155). I am thankful to Professor Iraj Rasooli in the Medicinal Plant Research Center of Shahed University for valuable assistance. I would like to thank sincerely Professor Rustaiyan for assistance in the botanical and phytochemical information. I would also like to thank Dr. Vali Aallah Mozaffarian for help in collection and identifying plant material. This study was financially supported by the Research Deputy Office of Islamic Azad University's Takestan Branch (Grant No. TIAU: 50155). Rustaiyan A, Masoudi S. Chemical composition and biological activities of Iranian Artemisia species. Phytochem Lett 2011;4:440-7. Rechinger KH. Artemisia. In: Rechinger KH, Hedge IC, editors. Flora Iranica Compositae. No. 158. Austria: Akademische Druck und Verlagsanstalt, Gras; 1986. Rustaiyan A, Mojab F, Masoudi S, Yari M. The composition of the essential oil of Achillea tenuifolia lam. from Iran. Iran J Chem Eng 1999;18:108-10. Mozaffarian VA. Dictionary of Iranian Plant Names. Tehran: Farhang Moaser; 1996. Taherkhani M, Rustaiyan A, Nahrevanian H, Naeimi S, Taherkhani T. Comparison of antimalarial activity of Artemisia turanica extract with current drugs in vivo. J Vector Borne Dis 2013;50:51-6. Adams RP. Identification of Essential Oil Components by Gas Chromatography/Quadrupole Mass Spectroscopy. Carol Stream, IL: Allured Publ. Corp.; 2001. Rasooli I, Mirmostafa SA. Bacterial susceptibility to and chemical composition of essential oils from Thymus kotschyanus and Thymus persicus. J Agric Food Chem 2003;51:2200-5. Lau CB, Ho CY, Kim CF, Leung KN, Fung KP, Tse TF, et al. Cytotoxic activities of Coriolus versicolor (Yunzhi) extract on human leukemia and lymphoma cells by induction of apoptosis. Life Sci 2004;75:797-808. Sylvestre M, Legault J, Dufour D, Pichette A. Chemical composition and anticancer activity of leaf essential oil of Myrica gale L. Phytomedicine 2005;12:299-304. Maron DM, Ames BN. Revised methods for the Salmonella mutagenicity test. Mutat Res 1983;113:173-215. Sharafi SM, Rasooli I, Owlia P, Taghizadeh M, Astaneh SD. Protective effects of bioactive phytochemicals from Mentha piperita with multiple health potentials. Pharmacogn Mag 2010;6:147-53. Hassanzadeh Khayyata M, Karimi H. Composition of the volatile oils of three different species of Artemisia Iranian. J Pharmaceut Sci. 2004;1:33-37. Taherkhani M. Tyrosinase inhibition,In vitro antimicrobial, antioxidant, cytotoxicity and anticancer activities of the essential oil from the leaves of Artemisia turanica, growing wild in Iran. J Essent Oil Bear Plants 2016;19:1141-54. Taherkhani M, Rustaiyan A, Taherkhani T. Composition of the leaf essential oils of Artemisia ciniformis Krasch. et M. Pop. ex Poljak, Artemisia oliveriana J. Gay ex Bess. in DC. and Artemisia turanica Krasch., Three Asteraceae herbs growing wild in Iran. J Essent Oil Bear Plants 2012;15:1006-12. Firouznia A, Akbari MT, Rustaiyan A, Masoudi S, Bigdeli M, Tabatabaei Anaraki M. Composition of the essential oils of Artemisia turanica Krasch., Helichrysum oocephalum boiss. and Centaurea ispahanica boiss. Three Asteraceae herbs growing wild in Iran. J Essent Oil Bear Plants 2007;10:88-93. Ramezani M, Fazli-Bazzaz BS, Saghafi-Khadem F, Dabaghian A. Antimicrobial activity of four Artemisia species of Iran. Fitoterapia 2004;75:201-3. Lazutka JR, Mierauskiene J, Slapsyte G, Dedonyte V. Genotoxicity of dill (Anethum graveolens L.), peppermint (Menthaxpiperita L.) and pine (Pinus sylvestris L.) essential oils in human lymphocytes and drosophila melanogaster. Food Chem Toxicol 2001;39:485-92. Behravan J, Ramezani M, Hassanzadeh MK, Eliaspour N, Sabeti Z. Cytotoxic and antimycotic activities of essential oil of Artemisia turanica Krasch from Iran. J Essent Oil Bear Plants 2006;9:196-202. Tayarani-Najaran Z, Sareban M, Gholami A, Emami SA, Mojarrab M. Cytotoxic and apoptotic effects of different extracts of Artemisia turanica krasch. On K562 and HL-60 cell lines. ScientificWorldJournal 2013;2013:628073. Emami SA, Vahdati-Mashhadian N, Vosough R, Oghazian MB. The anticancer activity of five species of Artemisia on Hep2 and HepG2 cell lines. Pharmacol Online 2009;3:327-39. Taherkhani M.In vitro cytobiochemical potentials and protective effects of bioactive phytochemicals from Artemisia turanica. Pharm Chem J 2017;50:668-77.